From humble settings in a suburb of Athens, it now looks like Alexis Tsipras, the firebrand Syriza leader is poised to take the helm in the Greek parliament. Not only that, if the exit polls being released at the moment are anything to go by, he might even manage to make it with an outright majority. It’s already been a long day here in the beautiful marble building of Zappeion where the media centre of the Greek elections has been set up. Across the day, the world’s media have been coming and going as they turn their lenses and their keyboards on the developments in the Greek capital. Coming up to 19:00 pm, the centre began to fill up. We sat facing a large television screen showing live split-screen feeds of nine of major Greek and international TV stations. In the top right hand corner, a timer ticked down to when the polls closed as 19:00 pm. As the clock ticked down to zero, the official exit polls were released, and everyone gasped. Syriza has been leading in polls since these elections were called almost a month ago. Their lead has varied between 3-6%. What no one saw coming was the almost 10% gap that had widened between Syriza and New Democracy. Here in the eye of the storm, journalists immediately scrambled to report the numbers. Out of a parliament of 300 seats, Syriza needs an outright majority of 151 seats. Up until this moment, everyone has been talking about what kind of alliances Syriza will form in order to form a coalition government. Over the coming hours, we’ll learn if this will be needed at all. If the exit polls are to be believed, Syriza is on its way to form a government outright. 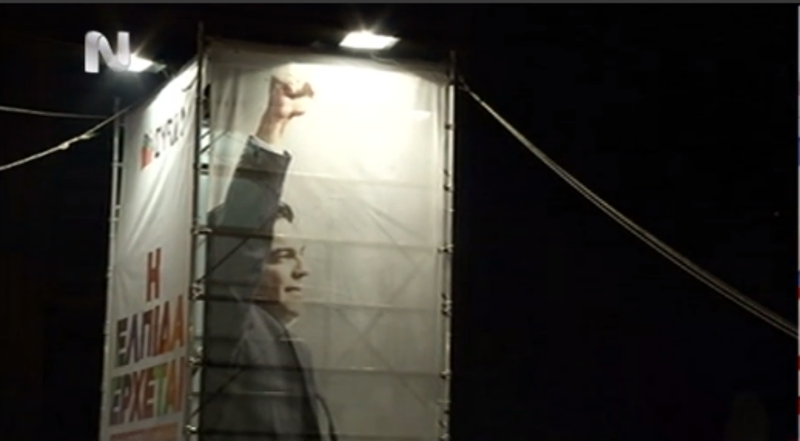 At this moment, there is a carnival atmosphere at the Syriza headquarters and in Propilia square. In the meantime, we have a long night ahead of us to see where exactly Greece stands. I, for once, am happy for Syriza’s victory. Sure, some of their ideas in their economic program strike me for being quite naive, but as a whole I saw a great deal of sense in what they’re proposing (unlike the ex-Commies in Italy, or that murderous tax evader that runs the Movimento Cinque stelle). I’m really happy that Greece has decided to stick the two fingers at Angela Merkel, because much of Greece’s woes are due to her indecisiveness and stubborn refusal to do what America and the UK did, i.e. help their economies recovering by going Keynesian. Result = Europe is stuck and going into deflation. So, well done Greece, I hope you’ll be able to sort yourselves out.